Kenneth Winston Spring 2017: Luxurious bridal designs for today's modern bride! 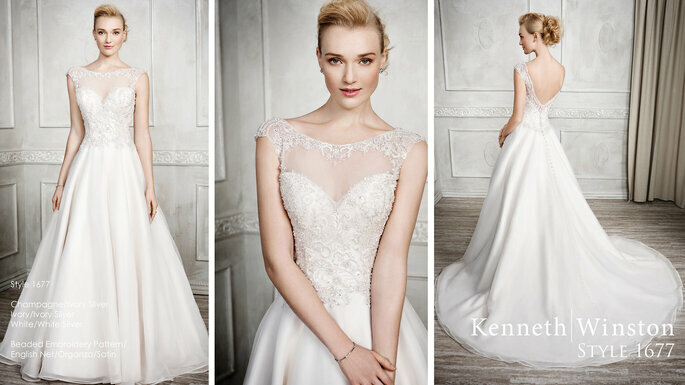 With over 30 years of experience in bridal fashion, Kenneth Winston have become leaders in the world of bridal design. Designers Ken and Winston have steadily grown and developed stunning collections that combine modern sass with old-fashioned charm. They aim to create collections in various styles to suit all types of brides. From A-line ball gowns to trumpet silhouettes, each dress is beautifully crafted with the highest quality materials. The precision and care that goes into creating each luxurious design is what makes them so unique and internationally sought after. “The beauty is in the details. Every design element, every intricate lace pattern, every crystal bead we put on a dress is tirelessly contemplated.” So whether you’re looking for a show stopping dress encrusted with 30,000 crystal beads, or a seamless all-over lace design, there’s something to suit everyone! The 2017 Spring collection focuses on the use of non-traditional ivory colours, along with the introduction of beautiful golden elements. The intricate beadwork, which they are renowned for, also makes an appearance throughout this breathtaking collection. A-line and dropped waist elements are always the main focus throughout their collections, and this year is no different! These silhouettes flatter all body shapes, and look wonderful on every bride. Lace and beading are carefully placed throughout the collection to emphasise the female figure and flatter in all the right places. If you opt for a Kenneth Winston design, your dress will be beautifully crafted with a combination of the finest fabrics. By layering different fabrics and textures they create beautiful dimensions in the dress that flow elegantly. Chantilly lace, satin, organza, tulle…the list is endless, no single fabric is ever used in their designs! This ensures that you will have a unique and breathtaking design. We just can’t get enough of the unique colours used throughout this collection. Champagne, café and gold threading are used to create the most stunning effects in these designs, one of the top trends in 2017 bridal fashion. The use of these different tones really makes the dresses stand out from the crowd, they’re perfect for the modern bride who is going for a classic and traditional style. So if you want to make sure that all eyes are on you as you make the way down the aisle on your big day, then this is definitely the collection for you! 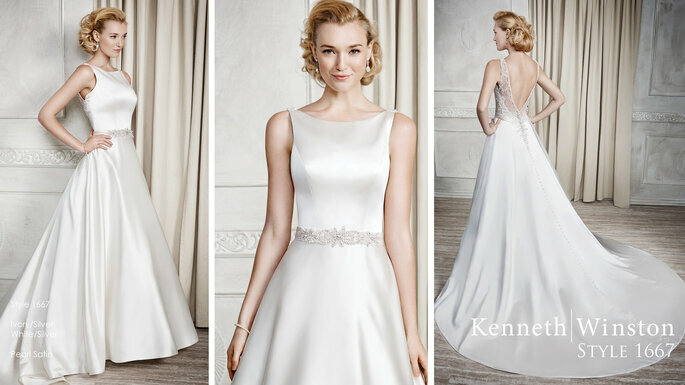 Make sure you shine and sparkle on your wedding day in one of these beautiful Kenneth Winston designs.